We consider prototype build & test to be an essential part of our development process as it provides verification that the concept is sound and that it performs in the way that it should. 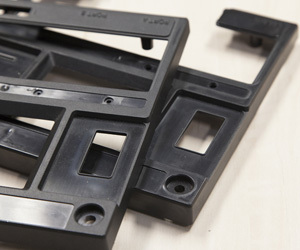 Through established connections with prototyping facilities we can utilise both Rapid Prototyping (RP) and traditional techniques to generate prototypes for fit, form and functional testing. Our products typically feature sheet metal fabricated parts, parts that are precision turned or milled from solid, extruded aluminium alloys, sand and High pressure die cast parts made from casting grade aluminium alloys, plastic parts made by Injection Moulding or fabrication as well as cable harnesses, labels as well as bespoke cooling hardware and technology. The materials used for these processes often deliver specific performance which needs to be delivered by a prototype if it is used for any form of verification. A key question we ask therefore is what is the purpose of your prototype? What is it that you wish to gain? Nowadays additive processes such as Stereo lithography (SLA) and Synthetic Laser Sintering (SLS) can be used to create geometry that was previously impossible by other means. The very real danger is that parts can be prototyped with success but not made in volume. Once production-quality models exist we will organize and manage testing for product compliance and certification to both customer and regulatory requirements. We enjoy a close and flexible working relationship with an excellent UKAS-accredited test facility that provides us with the test facilities for engineering test and validation when required. If at all possible we will involve a client’s chosen Contract Manufacturer to support the prototype build. This helps bring the manufacturing community “up-to-speed”, provides us access to the approved supply chain, provides us with valuable input and eases the ramp to volume manufacture. For more information on prototype build & test, or any of our other services, call us on 01277 261066 or email us.